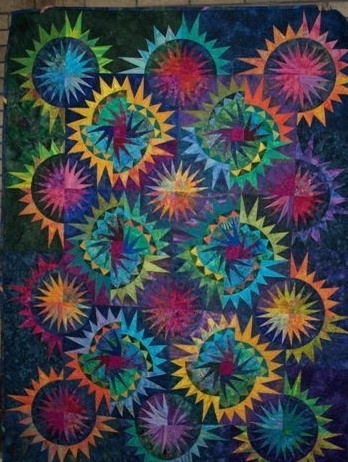 Kim Zebrowski hopes the quilting community can help locate this quilt, called Quilting with the Stars. This was the guild�s raffle quilt for the 2015-2016 year. It is now missing and presumed stolen. 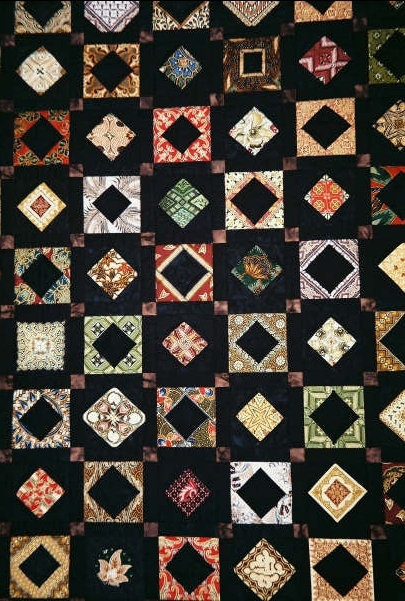 The Capital Quilter�s Guild of Raleigh, North Carolina had raised about $900 of the expected $4,000 so far. They realized it was missing at the November guild meeting on November 19, 2015. The disappearance is a great loss to the guild. This queen size quilt was made with four shades of blue and many yellows. 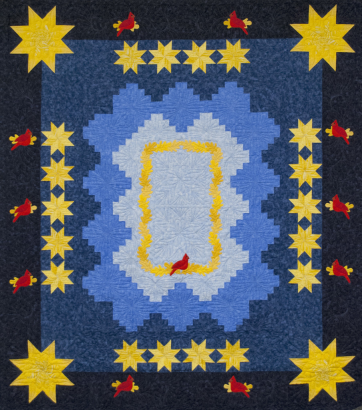 The quilt has appliqued oak leaves in an oval in the center with a cardinal. 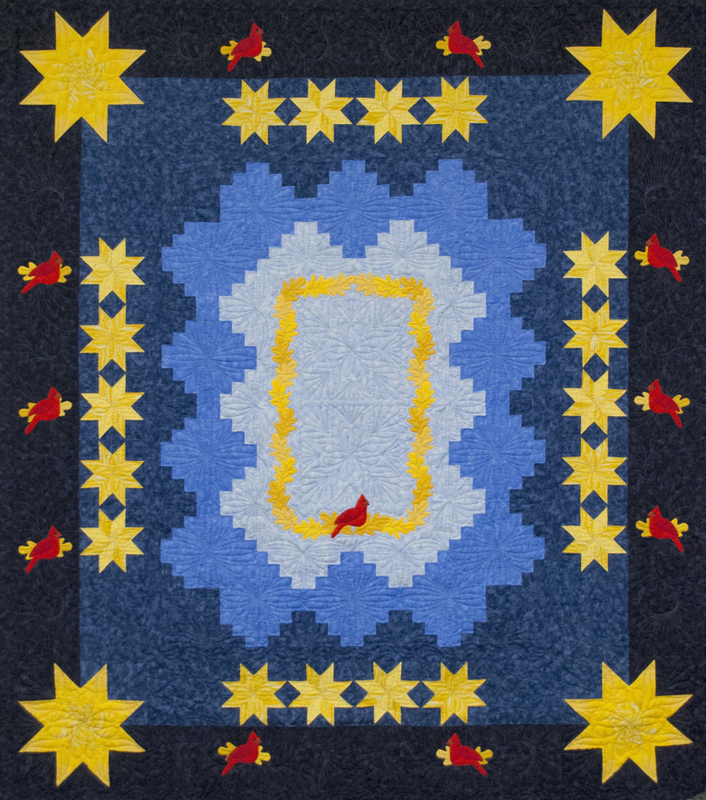 There are pieced stars and appliqued cardinals around the center. The quilt is labeled with a list of guild members who made the blocks. Kim�s name is also signed on the back of the quilt under the label. The label is appliqued to the bottom right corner. 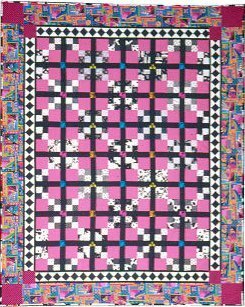 This quilt is truly a �Guild� quilt as it was designed by a guild member, blocks were made by guild members, a bee put all the blocks together. The hand appliqued leaves and cardinals were done by Kim Zebrowski and the custom quilting was done by Cathy Kirk. 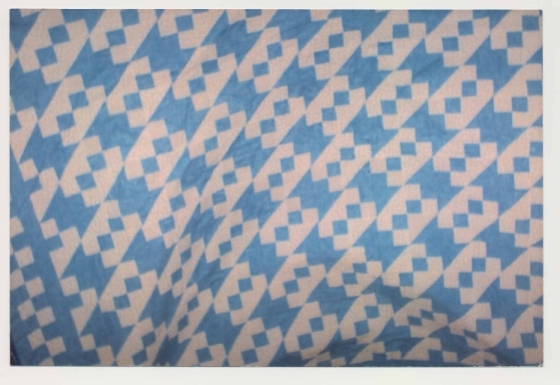 If you find this quilt, please contact Kim at kimthez@aol.com. 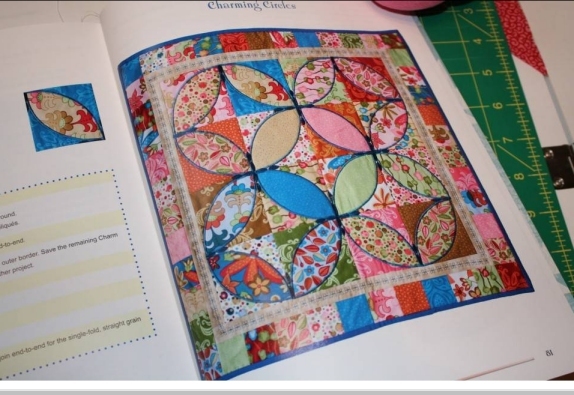 "Charming Circles" made by Kimberly Einmo, and featured in her book Jelly Roll quilts and More! This came up missing after the Scrap and Sew Open House in Lutz, Florida. Missing in Alaska...here's the story and contact info! FOUND!... But Whose is it? "...On Sunday, June 21st, one of my neighbors found a quilt on the westbound lane of Hwy 64 near Tarboro, NC. She says the quilt was wrapped in one of those plastic blanket packages. 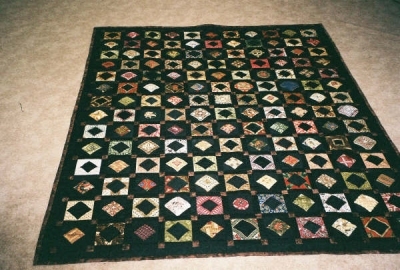 The quilt appears to be newly made, in wonderful condition. She says it is hand and machine quilting. There is no label attached and she cannot find a signature. She wants to return it to its owner, as she is a needle worker, and says she would be sick if she lost one of her works. "Marine Robert Lamica was getting ready for his second deployment to Iraq on Monday. So his parents drove to North Carolina to bring his wife and the couple's belongings back to Massachusetts. During the trip home to Florence, the family stayed at a motel in Delaware. While they slept, a security camera recorded their car and Uhaul being driven away, stolen in the middle of the night. Along with everything Robert and his wife owned. Lamica says, "Everything they own is on that truck and in the trailer, all of his Iraq medals all of his Iraq pictures, their wedding pictures, their furniture, their clothes, everything they own is on that truck." 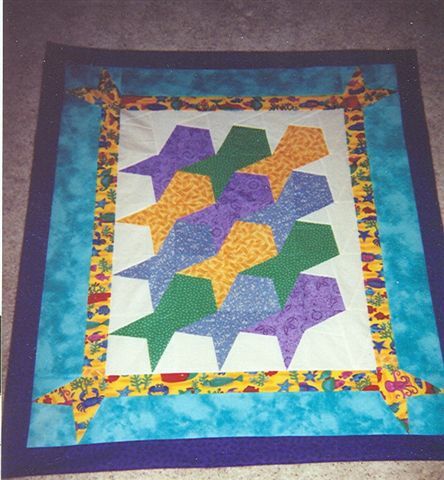 Please contact Jeanne if you have any possible info about this quilt! http://www.vaquiltmuseum.org/ Click on Contact info on the left side of that page. 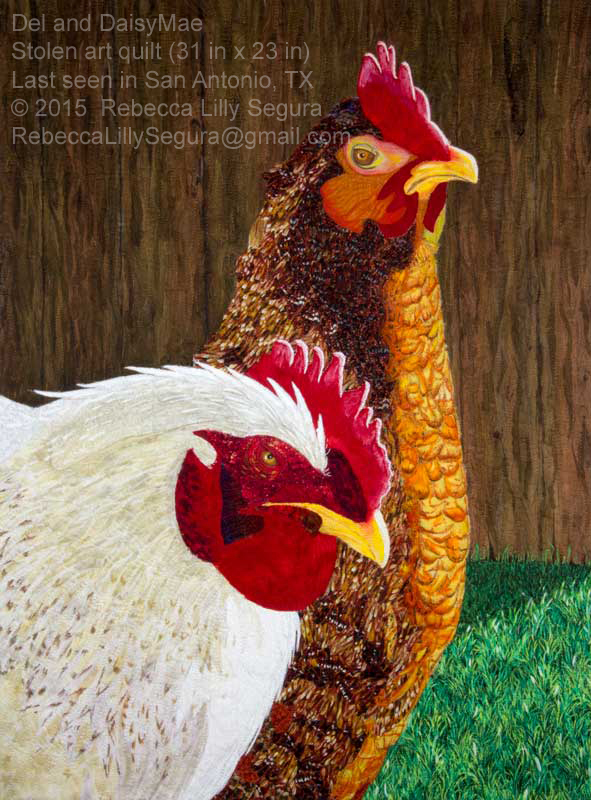 Both were First place winners at the fair and the Fourth of July quilt was best of show. You may contact me at this e-mail for more information. Thanks so much. Please put lost quilt in the subject line! Thanks for the help! 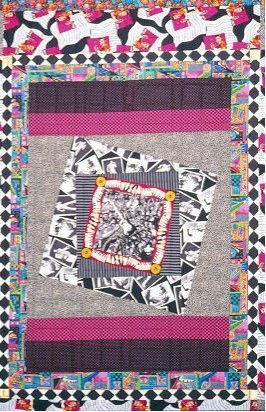 Marcia, this quilt was entered in the Arizona State Fair, 2006. We have an "outreach" program which allows us to drop off out quilts, and a volunteer collects and delivers them to the fair, also picking them up after the fair. This quilt was not recovered.? 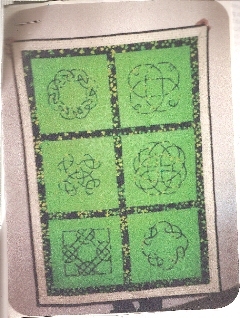 It is an Irish Celtic Design, about 40x55 inches, lime green background with appliqued Celtic knots and hand quilted. 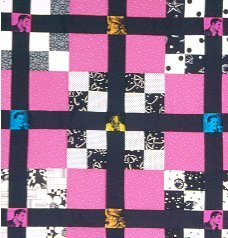 Marcia, The quilt that I made for my first granddaughter, Logan, is missing. It was in a box with another quilt I made for her, and came up missing during a move. Logan's tesselated fish is about 36" X 42-46". I didn't have quite enough of the yellow background sea-life fabric for the first border, and there are small areas of yellow-gold fabric to fill the gap. Logan's name is embroidered or written on one of them. The quilt is machine pieced and hand quilted. The fish are blue, gold, purple and green. The first border is a multi-colored sea-life fabric, and the next border is aqua. It has a dark binding. My name, Linda Hynick, is on the label on the back. Another quilt was also in the box. 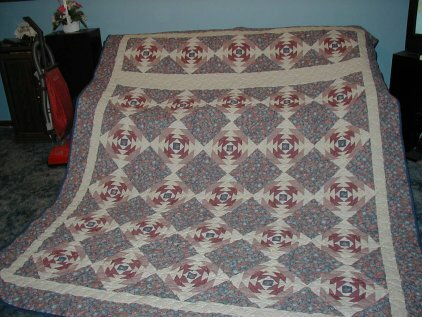 It is probably 36" X 45" and is a flannel rag style quilt. It has pastel and baby print flannel fabrics on the ragged side, and darker, winter fabrics on the back side. 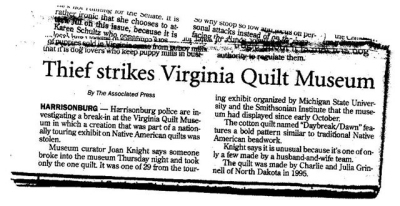 I do not have a photo of this quilt. The box was missing after a move on 11/21/06 from Phoenix to ElMirage, AZ. The moving company is Starving Students, and they deny having or having seen the box. 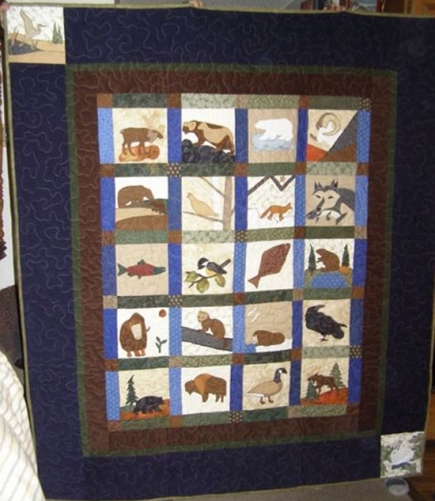 Anyone finding the quilts can contact me at lhynick@hotmail.com . Please put lost quilt in the subject line! THIS QUILT HAS BEEN FOUND!!!! WAHOO!! !